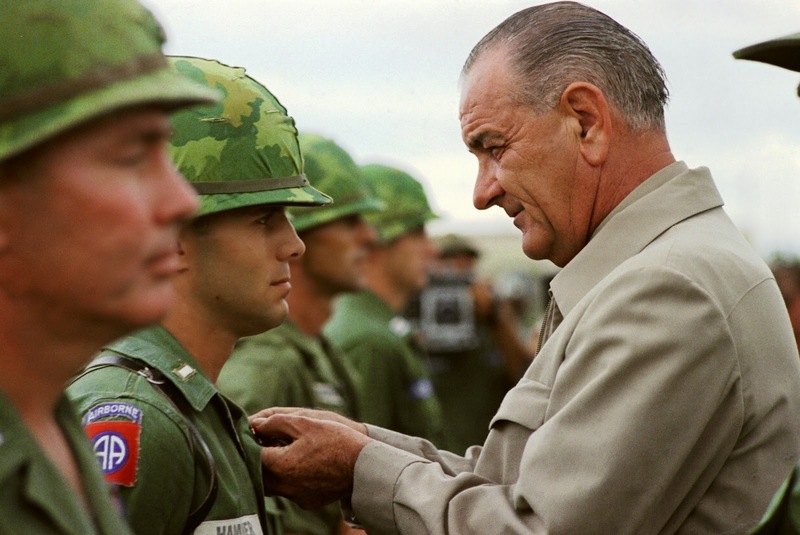 President Johnson decorates soldiers on a visit to Vietnam. US involvement with Vietnam begin under President Eisenhower and continued under President Kennedy, but it was the man who came after him who ended up most associated with it. Lyndon Baines Johnson was Kennedy's Vice President, becoming President himself when Kennedy was assassinated in 1963. Vietnam was to become the first war that the United States would lose. In this case study, you'll examine how President Johnson tried, and ultimately failed, to turn the tide in a war he didn't really believe in himself. "I don't think it's worth fighting for and I don't think we can get out. I don't see that we can ever hope to get out of there once we are committed. It's just the biggest damn mess." Supported the Domino Theory. Believed that US influence in south-east Asia depended on a victory. He didn't want to be the first President to lose a war. Ran for re-election in 1964 against Barry Goldwater, who suggested using nuclear weapons. Johnson ran as the candidate of peace and won in a landslide, but was faced with two dire options: withdraw and let North Vietnam win or commit a large number of troops. North Vietnamese boats fired on the USS Maddox in the Gulf of Tonkin. They reported the same thing a few days later. Controversy: was this genuine or was it a set-up by the US patrols? What led Congress to pass the Tonkin Resolution? What did it allow Johnson to do? What was Operation Rolling Thunder? Besides attacks, what else did Johnson announce for the South? Build-up: How many US troops were stationed in Vietnam by 1967? How much was the war costing? Four Points vs Fourteen Points: Were the US and the Vietnamese close to negotiating? Why? What tactics was the US using in the war? What happened in My Lai in 1968? How was success measured? How was napalm used? How many bombs were dropped? Why did the war turn against the Americans? What was the Tet Offensive? What was its impact? How did it affect Johnson's leadership? US Generals wanted more troops - why did Johnson believe this wasn't possible? How was Johnson affected by the credibility gap and the anti-war movement? How did he attempt to change his policy? Results of the Vietnam War: What were they? 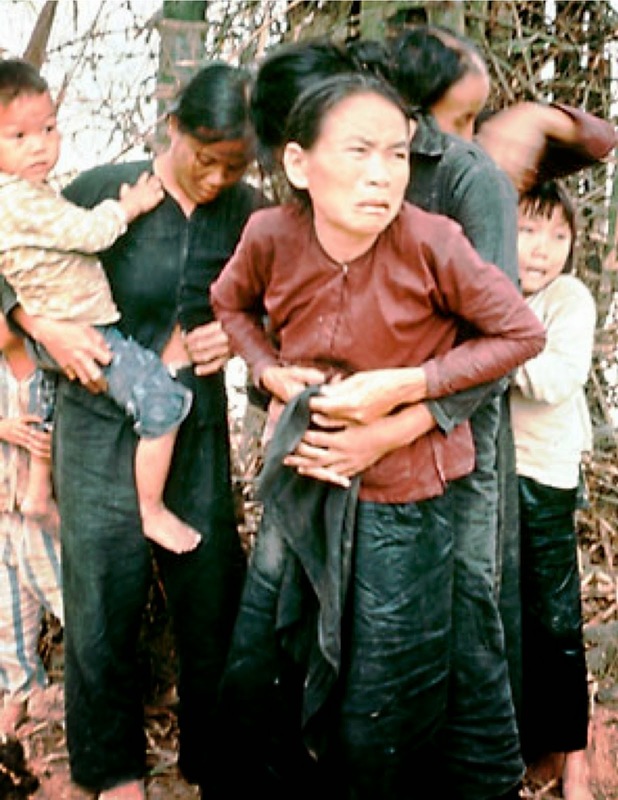 Survivors of the My Lai massacre in 1968. 2016: Who was the greater president, Truman or Johnson? Argue your case, referring to both. 2014: What were the strengths and weaknesses of Lyndon Johnson as a political leader? 2013: Which president was more successful in his handling of US foreign policy, Harry Truman or Lyndon Johnson? Argue your case, referring to both. 2011: Why did the US lose the Vietnam War? 2010: What were the successes and failures of the presidency of Lyndon Johnson? 2006: Which had a greater impact on the United States: involvement in Korea or involvement in Vietnam? Argue your case, referring to both. 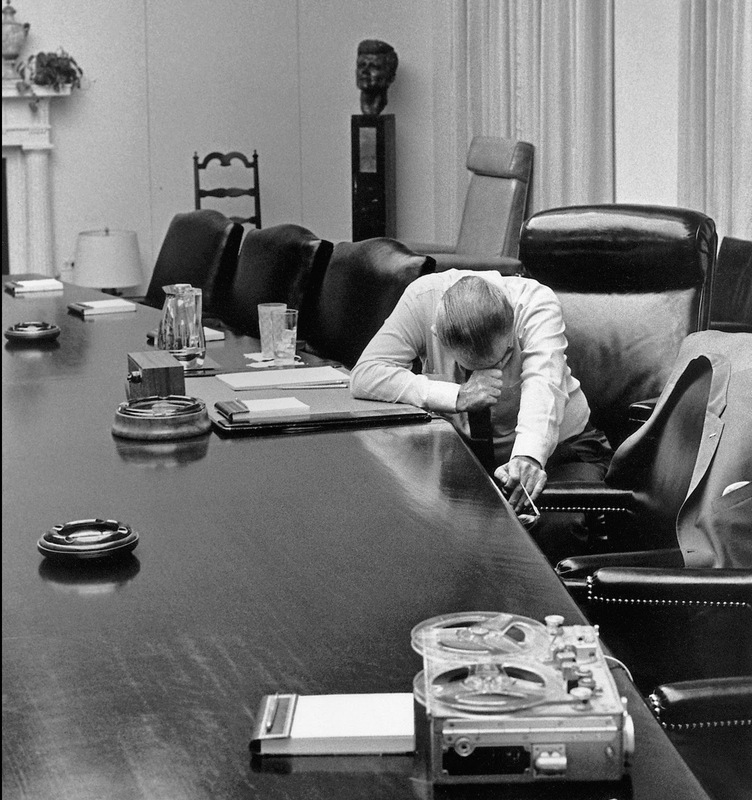 President Johnson listens to a recording by his son-in-law, Marine Captain Charles Cobb, in Vietnam.